Third episode of the series of display options in custom report tables. This week, a small tip which will show you how, during the construction of a data table in a report, display or not icons of universal search (US). I’m in the configuration of my custom report. I chose the “keywords” entity, the “table” visualisation and the “position” indicator. “Position” indicator selected, click on the pictogram represented by a small gear. The indicator options displays. 1/ If you select the “show universal search icons” box, the icons will display in the table. 1/ If you uncheck the “show universal search icons” box, the icons will not display in the table. 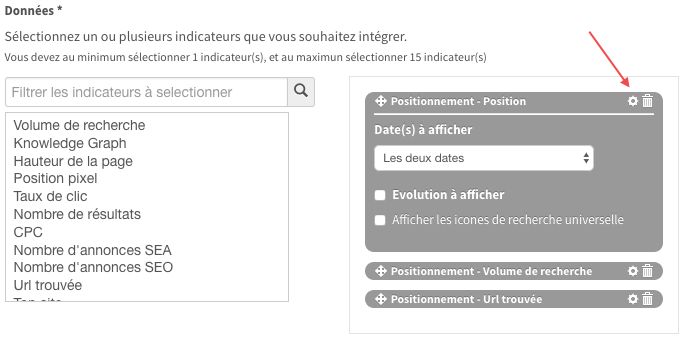 Note: If your campaign does not track universal search result, it will not possible to display the icons in a table.